The areas shortlisted to become the first flagship housing zones in England are announced. The government has today (8 January 2015) announced the areas shortlisted to become the first flagship housing zones in England - to help provide thousands of new homes across the country. A shortlist of 29 areas outside London has been published, each of which have bid to become one of 10 housing zones, where it will be easier and quicker to build new homes on brownfield land. Getting Britain building is a central part of the government’s long-term economic plan. Since 2010 over half a million new homes have been provided, including more than 200,000 affordable homes. A key part of our long term economic plan is to build the houses Britain needs so that more families can have the security that comes with home ownership. That’s why I’m delighted to announce the areas shortlisted to become the first housing zones in England which, as part of a wider package of measures, will help deliver up to 200,000 new homes on brownfield land. Alongside other important measures like Help to Buy, we are doing everything we can to boost housing supply and to make sure people can get a home of their own. Getting Britain building is a vital part of our long term economic plan. And, since 2010 we have seen construction on new housing rise to the highest level since 2007. Twenty-nine areas across England have now been shortlisted to become one of the first housing zones, to deliver new homes quickly on brownfield land. The 10 that are finally chosen will then have the chance to build homes for local communities while continuing to protect the green belt. In the year to September planning permission was granted on 240,000 new homes – near-record levels - while housebuilding starts are at their highest since 2007. 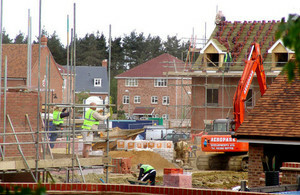 Since 2010 the government has taken a number of steps to ensure brownfield land is prioritised for new housing development – including abolishing top-down regional strategies which had earmarked green belt land for new development, and selling enough publicly-owned, surplus brownfield sites for 100,000 homes. On top of this, the government has looked to make the best possible use of existing properties – introducing new flexible planning rights so empty and under-used buildings can be brought back into use, launching a new Right to Contest so the public can challenge the government to sell its land and property, and offering financial incentives to reduce the numbers of long-term empty homes. All this has brought the numbers of long-term vacant properties to a 10-year low, while official statistics now show that the level of green belt development is now at its lowest rate since modern records began in 1989. But the government wants to go further. Across the country there is enough brownfield land to provide up to 200,000 new homes. Ministers expect to see planning permissions covering 90% of this land to be in place by 2020. As part of that, the government plans to create 10 housing zones across the country outside of London – complementing a further 20 zones inside the Capital. Most housing zones are expected to be big enough for between 750 and 2,000 homes but larger schemes can also be considered. Successful bids were submitted by councils working with developers, and were invited to bid for a share of £200 million for infrastructure and land remediation to get their ideas off the ground. Successful zones will also have access to cheaper borrowing from the Public Works Loan Board and priority access to expert planning and technical support from the ATLAS service run by the Homes and Communities Agency. The 29 shortlisted bids announced today will now go through an assessment process which will include looking at value for money and commitment to delivering high quality homes quickly. Housing zones are an opportunity to unlock redundant brownfield land with the potential to provide viable housing developments. So I am pleased to see the projects shortlisted under our programme, which will contribute to much-needed new homes and successful places. Mr Lewis also announced that 37 councils will receive a share of £5 million funding in this financial year to help bring large-scale sites forward for development. This funding will provide capacity support for local authorities to enable them to undertake planning, project management and technical activities necessary to bring sites to the point of delivery. Each council has identified schemes capable of providing at least 1500 homes, and will now use this funding to speed up the necessary work, enabling homes to be provided sooner than would otherwise be possible.